Since 1961, Wazee Crane has been providing quality crane and hoist services to virtually every manufacturing and service market sector in the United States. Now, as part of The Timken Company, Wazee Crane has never been better positioned to serve our customers and invest in our future. Customer satisfaction is our ultimate objective, and we’ve worked hard to become a trusted name in the industry. We build, repair, and upgrade cranes and hoists of all types. Customized solutions are our specialty. From hoists to overhead bridge cranes, our engineers use advanced technology throughout the design, calculation, building, and testing processes. Additionally, for companies who have the ability to fabricate on-site, we can provide designs and calculations in electronic soft copies. Wazee Crane has the ability to build a crane for any customer regardless of their application or location. Wazee Crane is proud to have served the Rocky Mountain region of the US for many years. As we have grown, so has our service area, which now includes all 50 of the United States. And, now, as part of The Timken Company Wazee has the resources and additional expertise to custom build and ship cranes of all types anywhere in the world. We offer 24/7 repairs and service to work with any schedule. Our expert inspectors help ensure your cranes or hoists are in full compliance with safety and operational standards, and our repairs will get them in top working order. For companies with older models of cranes, we can perform upgrades that will improve day-to-day functions. These upgrades can be mechanical, electrical, or both—and can reduce operating costs and increase safety on the job. 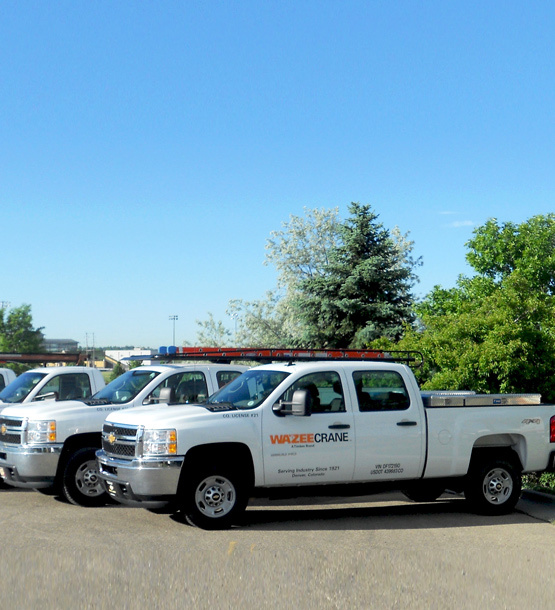 For more information or to schedule an appointment to see how upgrades can save you time and money, while increasing efficiency and reliability, call us today at 303-876-8092 or toll free at 800-624-1736 for a free, no obligation consultation. Need a reliable overhead crane? Choose Wazee. As the leading crane manufacturer in Colorado, we offer solutions for ongoing projects located throughout the Rocky Mountain region and beyond. Whether you need design, installation, inspection, or repair, we’ve got you covered. Our team of trained technicians can enhance your working environment and optimize your efficiency with our affordable cranes, parts and service. When your business calls for heavy lifting, you need an overhead bridge crane you can depend on. You don’t just want any crane; you want a crane that can meet your lifting requirements and last for years to come. You also want a crane that comes with a warranty and maintenance plan to make it a worthwhile investment. Wazee Crane gives your business a reliable crane and equipment for the long haul. We also carry a variety of products to meet your needs. When you purchase a Wazee crane, you get more than just a product. We perform a host of services to make sure your crane runs smoothly from start-up through years of demand. All of our products come with a minimum one-year warranty. We also provide several safety and maintenance programs, saving you money and keeping your workers safe. We offer load testing, crane modernization, 24/7/365 service, an in-house parts department and a support team to make sure your crane meets your highest expectations throughout its life. Wazee Crane is your high quality choice for overhead crane systems and you can count on our experienced engineering and expert service to keep your operations running smoothly. Contact us at 303-876-8092 or toll free at 800-624-1736, or simply click here to fill out the contact form to find a crane that is right for your business today. With almost a century of experience behind us, we know exactly what our customers need. We have the tools and training to serve a varied client base, in many different industries including: mining, agriculture, manufacturing, aerospace, oil and gas, and power generation to name a few. Regardless of your location, you can contact our Onsite Technical Services (OTS) group 24-hours a day, seven days a week, 365 days a year. At Wazee Crane, we understand the needs of our customers. We train our team to handle your unique, and, oftentimes, demanding schedule so your project can go off without a hitch. Time is money, and we have the utmost respect for the demands on your time. We support our customers from initial order placement, to design, manufacture and test, to installation and operation – and we do it within the time constraints that work for you. At Wazee we perform all of our engineering in-house. We can produce Professional Engineer (PE) stamped calculations and drawings and email them to you directly for review. None of our cranes go out the door without a thorough inspection. We check alignment several times on every machine before it ships out. We also clean all steel prior to painting to ensure excellent adhesion, appearance, and durability. And, in the unlikely event you do run into problems, we “run to the problem” to make sure you’re back online and running as quickly as possible. Trust our Onsite Technical Services (OTS) group to resolve the issue effectively and to your satisfaction. Our OTS representatives are available 24-hours a day to upgrade, service, inspect, test, and repair any of your cranes or crane equipment, regardless of who the Original Equipment Manufacturer (OEM) may have been. To schedule our OTS group’s services simply call us toll free at 800-624-1736.